The southern part of the Adelaide Hills region is most quickly accessed from the Adelaide CBD via the South Eastern Freeway, exiting at Stirling, Hahndorf or Mount Barker. Alternatively head south from Adelaide and travel through picturesque Coromandel Valley and the lovely township of Clarendon (be sure to stop at the bakery here). This part of the region covers everything from Jupiter Creek in the west to Callington in the east, and Mount Barker in the north to Prospect Hill in the south. It has a relaxing country feel, with rolling farmland home to beef cattle, horse studs and dairies. Base yourself here for a serene stay and easy day trips across the Hills, to the McLaren Vale wine region (and other Fleurieu Peninsula highlights such as Strathalbyn, Goolwa and Victor Harbor) and to Murray Bridge on the River Murray. A part of this area is known as Battunga Country, encompassing Meadows, Macclesfield, Echunga, Flaxley, Prospect Hill, Paris Creek, Kuitpo and Jupiter Creek. A rich tapestry of histories from the hustle of the gold rush era to agricultural pursuits on some of the most productive land in South Australia all combine to make a fascinating road of discovery as you tour the region. Kuitpo Forest Reserve near Meadows and Prospect Hill contains vast forest plantations and native vegetation zones containing a rich variety of trees, shrubs and ground cover species that provide significant habitat for native birds, reptiles and mammals. Kuitpo offers camping grounds, accommodation available for hire, orienteering, walking, cycling and horse riding trails. Meadows is a lovely country town and home to the popular Meadows Country Fair held every October. Macclesfield is best known for its historic and cosy pub called The Three Brothers Arms and Longview Winery for its cellar door, Sunday tapas, and stunning accommodation. Other nearby wineries include K1 by Geoff Hardy, Karrawatta, By Jingo! Wines, Top Note and Griffin Wines. Jupiter Creek Gold Diggings - The most successful gold mining site in the region during the mid to late 1800s was Jupiter Creek at Echunga, which attracted 1200 miners at its peak. Several reminders of this era remain, including a Cornish-style stone chimney. Miners returned to the area in the 1930s to try their luck during the Great Depression. Visitors can undertake the self-guided Jupiter Creek Heritage Trail. Please note the 80 metre Phoenix Tunnel underground walk is permanently closed for safety reasons. Callington’s Mining History - Situated on the Bremer River, Callington is a well preserved microcosm of a mid 19th century Australian mining community, with the whole township included on the Register of the National Estate. 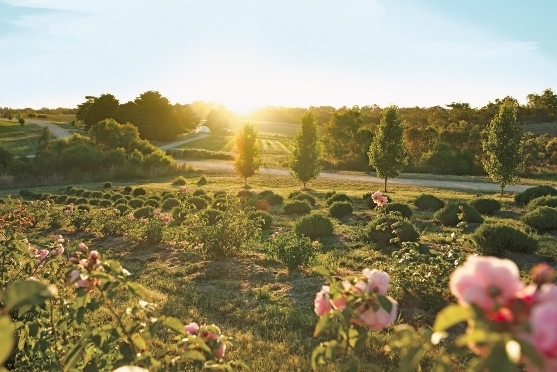 Tours of Jurlique’s biodynamic farm at Biggs Flat (south of Hahndorf) show visitors how and where the herbs and flowers are grown for one of the world’s most recognised skin care brands. Enjoy an interesting insight into their plant propagation, harvesting and processing.